We currently receive no financial support from governmental bodies, foundations, or other NGOs. Individuals who support our projects donate money to keep us going. Members are able to provide loans to Eco Hacker Farm at times when these are needed, as a necessity and not on a whim. The aim of the project is ultimately to be self sufficient and therefore not need credit from its members. It is important to note that members are only reimbursed when these are pre-approved by EHF. If you are interested you can read more about the terms for pre-approval of expenses and reimbursements / loan repayment. Here we provide information as to how we manage this project from a financial perspective. We had no material donations in 2017. We had no rental, heating and telephone costs in 2017. We had server service (uberspace) and whois guard. We didn't have any maintenance costs in 2017. We didn't have any enhancement costs in 2017. We would like to increase interest in Eco Hacker Farm and have a supporting community that is able to keep working on our shared ideals. We will try to obtain funding from online programms that support open source projects, particularly for powerplant. We would like to increase our payment for the uberspace server services to 10 Eur a month for a total of 120 Eur a year. Uberspace provides the service at a pay as much as you want basis and we would like to support this. 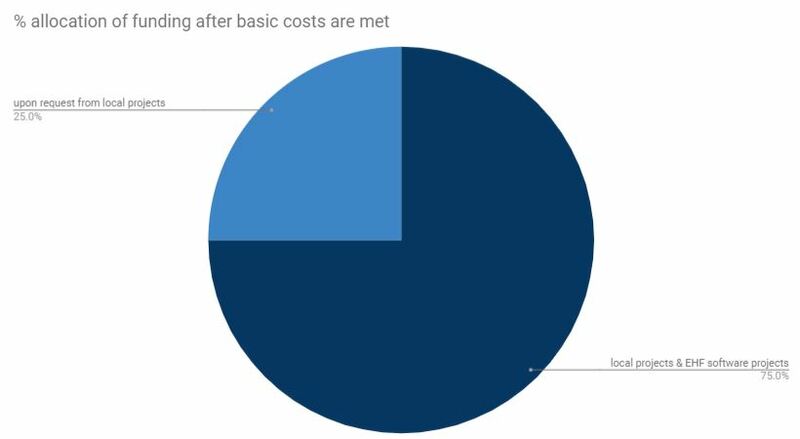 This brings up our Basic Costs annual expenditure to not more than 165 Eur a year.